The new sensation is perfect: Erfurt will be the Olympia city once again. "Limitless cooking - come, see, try and be amazed"- under this motto the international chef elite meet in Erfurt from 22nd to 25th October 2016 for the largest culinary show worldwide. For the fifth time since 2000, the exhibition halls will be transformed into gourmet restaurants and show plate temples to give international cooking art a stage. "The decision that Erfurt would be the location for the 24th IKA/Culinary Olympics in October 2016 was supported by all mandate holders", announced Robert Oppeneder, President of the Association of German Chefs e.V. (VKD), on 10th March 2013 during the coverage of the congress INTERNORGA in Hamburg. 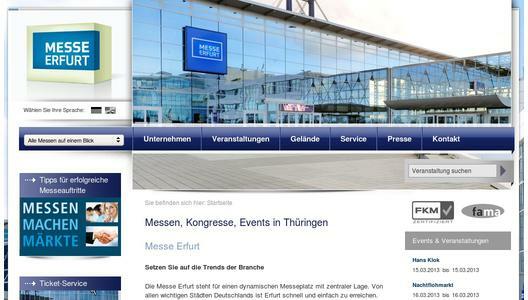 "The Erfurt Congress GmbH is the perfect location for the IKA. The congress hall position in the middle of Germany and of Europe has proven attractive for Partners and Sponsors of the VKD." With support from the State of Thuringia and the Federal State capital Erfurt, as well as partners from the tourism, hotel and gastronomy industries, the official application for Erfurt as the new venue was highly endorsed. Thuringia's President Minister Christine Lieberknecht said about the decision: "I am very happy that the Culinary Olympics will take place in Erfurt. The Erfurt Exhibition Centre, as well as the Gastronomes & Hoteliers of Thuringia offers the best conditions and the perfect meeting place for chefs from all over the world." Congress Chef Wieland Kniffka sees another reason for the re-election of Erfurt as the location for the IKA: "Around 16,000 visitors came to IKA in 2000, in 2004 over 21,000, and in 2008 23,000 visitors came. In autumn 2012 we greeted over 24,000 impressed visitors from 36 countries." From 5th to 10th October 2012 2.000 Chefs from 54 nations took part in the world's largest competition for professional chefs and 350 international media groups followed the six day show live as it happened. 1.700 freshly prepared menus were served daily. In addition 536 individuals presented their master creations. The Olympia victory went to the team from Sweden. The Germany came in third place behind Norway, judged from the overall ranking.